The fastest ever production Bentley is about to be unveiled and it will feature the firm’s iconic 6.0-litre twin-turbo W12 engine which has been tweaked to produce even more torque to help this peak of luxury motoring reach a top speed of 206 mph. Called the Bentley Continental GT Speed coupe, the vehicle will have its chassis lowered and suspension stiffened to help produce a firmer and more dynamic grip on the vehicle will make its debut at next month’s Geneva motor show. There’s no doubt that this will be the most powerful car in the Bentley Continental line-up and will offer buyers the most luxurious Grand Touring experience available. The designers have also been at work and they have restyled the flagship vehicle with some slight tweaks to the exterior and there are a range of luxury tailored packages for the entire Continental family. Anyone looking for supercar performance with unrefined levels of refinement should look no further than the Bentley Continental GT which is now more distinctive. Changes includes an elegant rear diffuser which matches the exterior paint scheme, a sharp front splitter and discreet side skirts. Potential owners will also find that the cabin has been tweaked too with contrasting colour stripes across the doors, inner console and gear lever. There’s also matching stitching to various parts and a new option to include contrast stitching with diamond quilting of the doors and seats. These are just fussy design changes but the real changes include new levels of technology including ventilated and massaging seats, a rear view camera and twin front arm rests. To underline its levels of luxury, owners of the Bentley Continental GT Speed convertible will find that it comes with an all-seasons specification which includes the ability to drive with the roof down in cooler environments so passengers will find in seat neck warmers, heated steering wheel and removable wind deflector being added. There’s a whole host of luxury editions that really do put the Bentley Continental GT back where it belongs. Meanwhile, Bentley have also announced another new edition to be appearing at the Geneva motor show; the Flying Spur luxury saloon which is now being fitted with the firm’s 4.0-litre twin turbo V8 engine. Bentley sees the new Flying Spur model as a bridge between motorists driving a premium saloon but wanting to move up to a more luxurious brand – this new model is the car they should be aspiring to. There are some slight style changes to distinguish the Flying Spur V8 from the firm’s flagship W12 version including computer-controlled air suspension to help absorb bumpy roads and on all-wheel drive system that provides better road grip to provide a reassuring level of stability and traction. 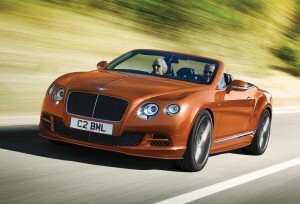 The new Bentley Continental GT Speed is available now and the new Flying Spur will be available in the spring. This entry was posted in Car Leasing, Cars, Executive Cars, Luxury Cars, Performance Car and tagged Bentley, Bentley Continental, Bentley Flying Spur, lease a Bentley Continental by Steve Lumley. Bookmark the permalink.